So, I guess this is goodbye– for now at least, for a while. Starting tomorrow, I’ll be officially joining the State Department’s Bureau of Near Eastern Affairs as an AAAS Science and Technology Policy Fellow. For the past 2 weeks, I’ve been going through AAAS orientation, a program designed to introduce scientists to Washington. This fellowship process has been quite the experience. I’m in a class of over 180 fellows–all Ph.D.’s in the sciences–who will be joining various agencies of the federal government as well as Congressional offices. There are a few social scientists, but I’m pretty sure I’m the only “political scientist” in the group. Most of my fellow fellows come from bench science, and are learning how Washington “works.” I as a political science type ostensibly already know this. The irony is rich, though, as our discipline teaches “politics” and then doesn’t understand why politicians tend to ignore our “scientific” policy advice. My week has been quite the clash of two syllabi: Intro to Political Behavior meets Intro to Research Methods. For any of you looking for a fantastic way to spend a year (or two!) in government, I’d highly recommend checking this fellowship. While Dan’s is the one that gets all the accolades in our field (and Dan certainly deserves accolades for it), the AAAS fellowship does essentially the same thing. We’re in need of some more social scientists in the program! AAAS is tremendously supportive of its fellows, and the mission of this fellowship is to better connect science and policy. Its a goal I support, even as a “scientist” who studies policy. As I depart the blogosphere for a prolonged hiatus, I’d like to thank everyone here at the Duck for inviting me to be a part of this wonderful community. When I started blogging, it was at the suggestion of my then teaching assistant (who I am proud to now call a colleague) who told me blogging was much cooler than discussion boards on Blackboard. As it turns out, I really like blogging. But, I think, one of the reasons that I enjoy it so much is this site and this community–a fantastic group of readers and commenters. As for me, my future is a lot less clear. For the next year I’ll be at State. AAAS Fellowships come with an option to renew for a second year, and that is a very real possibility for me. As loyal readers know, I have mixed feelings about our field and profession. I loved my time as a scholar and professor. But, I did so from a non-tenure track position, working on yearly contracts and picking up an administrative job to maintain my position. I enter the policy world without a spot in the academy waiting for me to return. At this point, I can honestly say that I have no idea where I will go once this fellowship ends. That’s scary, but also exciting. So, goodbye. For now at least. Which nations will be our key partners? What do you do when many vital partners — China, for example, and Russia — are rivals as well? How must America’s alliances change as NATO is stretched to the limit? How do we engage with rogue states and old enemies in ways that do not strengthen them and preserve our prerogative to challenge threats? How do we move beyond the diplomacy of men in striped pants speaking only for governments and embrace potent nonstate players and once-disenfranchised peoples? Clinton laid out her approach in a major speech to the Council on Foreign Relations last month (I actually listened to it as a podcast, you can get the audio here). She is doing the diplomacy, engaging in the practices that build relationships that constitute US standing in international affairs. During any Presidential Administration, there are heated debates, accusations of horrible mismanagement, and political intrigue, but they are actively papered over and downplayed by a powerful White House communications operation dedicated to protecting the image of the President. Once everyone leaves office, however….. It seems the floodgates of insider accounts that “make news” and tell heretofore unknown details about the good old days of the Bush Administration are opening, and the stream of details might be more interesting than most. Tom Ridge, the first secretary of Homeland Security, has a memoir coming out September 1, and the tease of salacious material is the revelation that the Administration did in fact manipulate the color-coded threat level with political considerations in mind. The most interesting of course are those from the principles themselves. Former President Bush is working on a memoir where he revisits the 10 most important decisions from his presidency, focusing on terrorism and how it dominated his presidency. And of course there’s the revelation that former VP Cheney is also at work, penning a memoir (the old fashion way, on legal pads that someone else can type up for him…) where he breaks with Bush on some key issues. Cheney, of course, was famous for deriding those who wrote tell-all books, right up until he started writing one. With all these memoirs, there will be the obligatory book tour and media appearances on all the major cable TV outlets. These guys need to sell books, so they will lay out some hints of juicy gossip and brilliant insight. As interesting, I think, is methodological question of how to use these documents as sources for the upcoming article on decision-making in the Bush White House (what–you don’t have that started yet?). On the one hand, these are valuable, primary source documents, the recollections of decision-makers and participants (or at least recollections as told to their ghost-writers/assistants). For scholars writing about the massive shifts in US foreign policy of the first Bush term, it might be useful to include both Bush’s and Cheney’s views on a key decision–information that can easily be gleaned from memoirs. However, its important to be careful how one uses memoirs. I’m reminded of the exchange between Brooks and Wholforth and English about the end of the Cold War. In arguing over competing arguments over the same events using much of the same evidence, they pick a fight over how to interpret the memoirs of Gorbachev and other high party officials. Each claims that the memoirs support the argument. Today, memoirs are about selling books and continuing the image-making process. That said, they still reveal interesting details about a situation that won’t appear in any contemporaneous journalism or even archived memos. What I’d really like to see–once all the “good” memoirs come out–is a discourse analysis of Bush Administration memoirs. Viewing these books as part of the construction of history rather than attempts at more accurate reconstructions of historic events would be quite the interesting project. Something to file away under the to-do list…. I just purchased a 16gig I-Pod touch. Its a fun new toy, and a more than ample replacement for my overflowing 2gig nano. I also added the new operating system. The benefits of a blog being the ability to crowd-source stuff like this, I ask loyal duck readers with a touch or iphone if they have any suggestions on how to get the most out of my new device. Any favorite uses, applications that are must-gets, or other cool things that can be done besides the standard music, photos, and the like? 1. Its a big political win for the President. Obama threatened to veto a defense bill. That just Does Not Happen–no one vetoes money for DoD. 2. This is the first major cut to a major weapons system in recent memory. The military industrial complex is mighty powerful, and a vast range of interests lined up to defend the F-22, led by its manufacturer and the congressional delegations of many of the states where significant parts of the plane are made. Leading supporter of the F-22 in the Senate? Saxbe Chambliss, R-GA. The F-22 is assembled in Georgia. The final vote tally shows bi-partisan support for killing the plane. It also shows bi-partisan support for keeping the plane. This spending is all about pork, and little about ideology. 3. It is a major victory for the prospect of restoring some sanity to the defense budget. As Spencer Ackerman points out, lose here and Gates and Obama have no chance to reign in the defense budget. The win here brings the Defense budget back to reality (if only a little bit, but its a start). Gates powerfully made the point that DoD needs that money more urgently elsewhere. Lest we forget, there are still 2 wars going on, with troops who need stuff to fight those wars. The F-22 has yet to see any role in either Afghanistan or Iraq. 4. It offers some hope to procurement reform at DoD. Much of the modern military–both operationally and administratively–is organized around the purchase of major weapons systems. This works if you have a great weapons system, but is incredibly inefficient, wasteful, and leaves you with the Army you’ve got– pace Rumsfeld, not the one you wish you had. One of the reasons we don’t have the military we wish we had is all of the support, doctrinally, institutionally, culturally, and financially for these weapons systems. The fighter jocks of the Air Force really want the F-22. They have resisted UAVs like Predator and Reaper and ugly Close Air Support planes like the A-10. And yet, these have been among the most useful and most in demand throughout the wars we’re actually fighting. The F-22? Not so much. 5. Gates went to the mattress on this one, with the full support of the President, and he won. He’s going to be in a commanding position to institute further reforms at the Pentagon. Its rather ironic, don’t ya think, just a little ironic, I really do think, that Rumsfeld came in determined to reform the Pentagon, and, arguably, left much of it in worse shape than when he arrived while Gates, called in to clean up the mess, so to speak, and then retained by an administration of a different political party which ran in opposition to the war Gates, as SecDef, was overseeing, manages to gain the bureaucratic and political strength to make reforms where it matters. The money. All about the Benjamins, that. So, yeah, a big deal today in the Senate. By the 40th anniversary of the Lewis and Clark expedition, the Oregon Trail was carrying settlers to the West. By the 40th anniversary of the completion of the transcontinental railroad, a web of rail traffic crisscrossed the continent. By the 40th anniversary of Lindbergh’s epic transatlantic flight, thousands of people in jetliners retraced his route in comfort and safety every day. And on the 40th anniversary of Sputnik, hundreds of satellites were orbiting the Earth. Only in human spaceflight do we celebrate the anniversary of an achievement that seems more difficult to repeat than to accomplish the first time. Only in human spaceflight can we find in museums things that most of us in the space business wish we still had today. …Well, space is there, and we’re going to climb it, and the moon and the planets are there, and new hopes for knowledge and peace are there. And, therefore, as we set sail we ask God’s blessing on the most hazardous and dangerous and greatest adventure on which man has ever embarked. Could Obama do this? Quite possibly. Reagan tried, Clinton tried, even Bush tried (PDF). Will he Obama do it–after he’s finished with the Economy, Health Care, Iraq, Afghanistan, and chopping the F-22? I’d love to see him try. 40 years ago today, Apollo 11 blasted off from Cape Kennedy on its way to the moon. Monday will be the 40th anniversary of the first moonwalk. In celebration, NASA has released restored footage of the moonwalk, revealing in incredible clarity the amazing steps of Armstrong and Aldrin. Its a fascinating moment for reflection on one of the most incredible accomplishments of the 20th century. The Space Program revolutionized America, revolutionized the world. 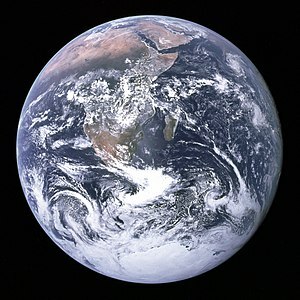 It thrust us into the computer age, and it provided one of the most famous images of our world, reminding us of our shared home. To put into context just how impressive the Apollo program was, it flew one of the most complex and powerful machines ever built, the Saturn V rocket, to the moon and back with less computing power than you have in your cell phone. All this, brought to you by your US Government. What I wonder is–could the US pull off a similar feat today? One of my students wrote a thesis this past spring essentially arguing no. Not because of the expense or the technical feasibility, but because of the lack of a good reason. Space, if you remember, was still the New Frontier in the 1960’s, something America could conquer in the midst of the Cold War when the Best and the Brightest still held promise for a greater tomorrow. It seems a romantic myth today, that the country would unite behind a goal of progress, scientific discovery, and exploration of new frontiers. Today we’re consumed with debates about health care, terrorism, and funding the F-22, and a functional space launch capacity is deemed an expendable luxury. Indeed, with the pending (and overdue) retirement of the Space Shuttle in 2010 (lets remember this is 1970’s technology that still flies), the US will lack the ability to put people into space until the Constellation Program launches somewhere around 2015. No one is concerned about the “space flight gap” with the Russians (as the US will rely on the Soyuz program to access the international space station in that time). There’s no hue and cry that NASA plans to de-orbit the space station in 2016. The space program has no role in any of this, and that lack of a legitimizing foundation has led to its undoing. In a way, space flight seems the ultimate source for international cooperation. Its sort of silly for the US and China and Russia to all compete to get back to the moon. From up there, there’s really no difference between any of us. The ISS was supposed to be a step in that direction. And yet, how much of a romantic myth it is to discuss a global mission to Mars or an outpost on the moon. 40 years ago today, that myth was much closer to reality than it is now. Why would she stick around as Alaska governor? Maybe to govern> Perhaps come up with some sort of signature program or philosophy on which to run? I know this all sounds crazy in the context of Palin, but those obsessed with the R nominee in 2012 need to relax. At this point 4 years ago, no one considered Obama a serious candidate. George Allen was still a contender. Palin is out for reasons that will certainly emerge over the coming weeks. I’m now officially done with 2012 until November 10, 2010. (updated after reading the morning paper) Kurtz goes there–the press won’t have Sarah Palin to kick around anymore. …really, I just couldn’t resist Marshall’s Duck line. How could any self respecting Duck blogger let that one slide?? I happened to be consulting the triangle on page 83 of Skocpol’s Social Revolutions in the Modern World for an article I’m drafting, and came across her chapter “Rentier State and Shi’a Islam in the Iranian Revolution.” I decided to take a closer look to see if there were any insights that might help put recent events into a broader context. Indeed there were. Currently missing in the current Iranian politics: open fracturing of the state security forces. Recent reports indicate that they are stacked (intentionally so) with Ahmadinejad loyalists. There is rampant speculation that there are rifts among the ruling elite, but no confirmation that any political splits between dominant classes and the state have actually emerged in a public fashion around which revolutionaries could mobilize. Revolutions are not made. They come. it was made through a set of cultural and organizational forms thoroughly socially embedded in the urban communal enclaves that became the centers of popular resistance to the Shah. Even when a revolution is to a significant degree ‘made,’ that is because a culture conducive to challenges to authority, as well as politically relevant networks of popular communication , are already historically woven into the fabric of social life. In an of themselves, the culture and networks of communication do not dictate mass revolutionary action. But if a historical conjuncture arises in which a vulnerable state faces oppositionally inclined social groups possessing solidarity, autonomy, and independent economic resources, then the sorts of moral symbols and forms of social communication offered by Shi’a Islam in Iran can sustain the self-conscious making of a revolution. No innovative revolutionary propaganda retailed to ‘the masses’ overnight, in the midst of a societal crisis, can serve this purpose. But a world-view and a set of social practices long in place can sustain a deliberate revolutionary movement. In 1981, she was talking about the cultural resources of Shi’a Islam. Superimposing “the Internet” as the social network already woven into public life (as Iran has a rather high penetration of the internet and Farsi is one of the fastest growing languages in use on the web and blogosphere), and perhaps the infrastructure exists to sustain a deliberate revolutionary movement. As Gary Sick reminds us, don’t expect instant resolution to Iran’s political crisis. The 1979 revolution unfolded over the course of a year, with fits and starts, ebbs and flows, before the old regime collapsed. Skocpol offers a useful reminder to temper our bold assertions made in the heat of the moment that any one particular event is necessarily a ‘game changer’ but at the same time, provides a framework for assessing how profound Iran’s political challenge are. 1. The State has decided to confront the People directly, with violent force. In 1979, the Shah fled rather than order the security forces of the state to turn on the people as they revolted. Revolutions can fail and repressive often states survive uprisings through the use of repressive force. This raises the stakes considerably, as people will and have died to advance the cause of revolution. It is at this point where the numbers really matter. Armed thugs can turn back a crowd of thousands, but not hundreds of thousands. Police can control large groups, but not hundreds of thousands of people determined to resist. If there are millions of people marching, it will take the military / revolutionary guards to repress them. Regardless of how this ends up, the very act of the state ordering its security forces to suppress popular demonstrators in such a public fashion does rob it of its legitimacy. It is a tipping point–either tipping the regime to ultimate failure or tipping the regime to a true garrison state. 2. Based on the reporting in the Western press, there seem to be splits among the elites. This matters because these fractions within the regime rob it of its full power and ability to present a coherent counter to the resistance. As clerics and perhaps certain members of the military defect, it lends legitimacy to those countering the state. Most importantly, it impacts the calculus of the soldiers who may be asked to fire on the protesters–as they defect, the regime crumbles. 3. The position of the resistance’s leadership has “evolved” to give voice to the broad grievances the people are lodging against the government, providing a manifesto for revolution. In a sense, the leaders have finally figured out where their supporters are going and rushed to the front of the crowd. This is important, though, because revolutions need a voice, a theme, a message, a way to instill social purpose in a movement such that people are willing to put their lives on the line for the cause. With the state cracking down violently, it will be very important for the resistance to rally faith in the cause and move people to step up and stand in harms way–who will give all they can give so that a banner may advance? As the incredible events in Iran unfold–in the streets of Tehran and on Twitter–the obvious question is: is this the ‘Green Revolution’ or something else for which we don’t have a pre-fab category. I would call your attention to two outstanding posts that give a very good insight into what to watch for. The unifying theme was perhaps best articulated by an anonymous Iranian commentator at Salon: “Legitimacy, much debated by social scientists, actually turns out to matter. It’s not just force that rules…” (h/t). In short, this is a moment of contentious politics* where the legitimacy of the Revolution, Islamic Republic, Supreme Leader and a few other major social institutions in Iran is in flux. 1. Rob Farley at LGM notes that the most important actors in the entire process aren’t the protesters, but the police. Farley’s review of the Tilly-esque story of the development of the state reminds us of the central function of the modern bureaucratic state is, as Weber noted so long ago, to maintain the legitimacy that allows rules to rule. States exercise the monopoly on the legitimate use of violence. When the security forces no longer feel compelled by the erstwhile legitimacy of the state, the state ceases to exist as we currently understand it. If you see the police, revolutionary guards, and others standing by, or even supporting the resistance, the game is up. Now, I’m not an Iran expert, and as Dan has noted, you should take all our analysis with that major caveat in mind. So, I don’t have an intimate knowledge of the institutional structure of the regime. That said, two points. First, the gangs of pro-regime thugs beating up protesters should not be seen to be the same as the State going after protesters. These groups may be encouraged by the ruling elite, but they are not the official actors of the state. They are thugs who wouldn’t be able to use force in normal times. Its those legitimated to use force who matter. Second, given the unique nature religion plays in the Islamic Republic, one might argue that some senior clerics might exercise the legitimate use of rhetorical force, so they bear watching as well. 2. orgtheory reminds us that revolutions are actually social movements that must have a social and organizational structure. These social resources–social networks, leadership, organizers, mobilizers, and experts–require time and effort to build and deploy. Its important to see if the protesters can wield any other levers of power against the regime beyond sheer numbers of people. It matters how many people come out– as Dan noted, thousands can be dealt with by the repressive institutions of the state, millions not so much. Its possible that the ability to conduct offensive cyber-war against the regime is a step in this direction. The potential for success comes when an alternative power structure emerges that could replace the existing regime in running the state. If the Supreme Leader falls, someone else needs to be ready to step in and take his (metaphorical) place. I’ll be a bit incendiary to justify these questions by pointing toward the invasion of Iraq: The kind of thinking which suggests that a large, loud, outburst topples governments and then magically leads toward the emergence of a new order which “makes more sense” was, in the end, what undid our efforts in Iraq. It was naive – of us then and perhaps of protesters today – to think that opposition and even toppling a regime is enough. It’s what comes next—the alternative power structures and institutions that will step into the void—which require our attention now. Because it will be a power struggle–just as it became in Iraq. Educating ourselves on the underlying layers of Iranian society is vital because understanding this is how the US and supporters of Iranians’ freedom can best lend target support. Now is the time to educate ourselves. Meaning, we need to be paying much more attention to what Gary Sick is saying, and not go overboard with the idea that we can fight the war with the right twitter-feed. *h/t PTJ who said this to me earlier today. This week the Colbert Report is broadcasting from Camp Victory, Iraq as part of a USO tour. Sporting a suit made of cammo, a regulation haircut, and swinging a golf-club Bob Hope style, he has been entertaining the troops, reminding people that there is still a war in Iraq, and offering some rather brilliant and bold meta-satire of the entire operation. If you haven’t been watching, you really need to. Right now. Last night he did what I thought was an exceptionally bold and brilliant sketch–a Formidable Opponent (Stephen debating himself) on Don’t Ask, Don’t Tell. Had this bit appeared as a regular segment on the show it would have been funny but unremarkable. Performed live, in front of an audience of hundreds of active-duty military members, at Camp Victory, in Iraq, its genius. Much has been said about DADT, from polling data showing support for its repeal to the role of his new Army Secretary in building support for repealing the policy. By mocking the policy in front of troops–and not just any troops, but those in a very active combat zone–to legitimate applause, he ridicules the policy to the point of rendering it a farce. From Iraq, the arguments that seem so self-important inside the beltway sound so hollow when forced to occupy center stage in front of military personnel who go in harm’s way each and every day. The entire enterprise is quite brilliant so far. Its quite the feat. He must respect, entertain, and build morale for the troops he’s visiting. He must be funny and produce a show for air that night. And, he is doing all that while still offering a fantastic meta-critique on Iraq policy. That’s hard to pull off in front of a live (and armed) studio audience. Not to mention the cameo’s he’s been able to secure. President Obama ordering General Odierno to give Colbert a haircut. Greetings from John McCain, Bill Clinton, George Bush (the older). Really, watch both episodes– Monday and Tuesday. I was listening to a CFR podcast of a special conference call on North Korea’s nuclear weapons test yesterday during my much longer than usual commute. One key part of the discussion centered around Japan’s response to the nuclear test and missile launches. Japan, it seems, is taking steps to improve its military capabilities in response to North Korea’s actions. Even the most extreme option–Japan going nuclear–seems to be lurking near the table. The conference call participants saw China as a key to the North Korean situation, with greater action possible this time in part because China wanted to keep North Korea in check to mitigate any potential Japanese military expansion. This raised an interesting puzzle. North Korea is nowhere near a great power. While they do have a large military, it old, outdated, and oriented toward the DMZ. They do have WMD and missiles, though the missiles are highly unreliable. China is a rising great power with a highly capable military that is increasing its ability to project power. For Japan, a state that has constitutionally limited its military power to self-defense missions and has a deep aversion to nuclear proliferation, to consider a military build up is a big deal. For the notion of nuclearization to even be broached is quite a major step. Good old balance of power theory might lead one to suppose that it would take the rise of a significant challenger to push Japan in this direction. But my guess is that it would ID China as such a challenger well before it would tag North Korea. 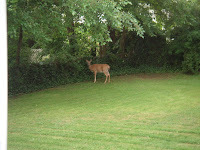 Oh Deer, what can the matter be? 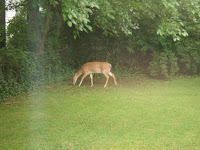 A deer has been wandering around the neighborhood over the past week, frequently sojourning in my fenced-in back yard. 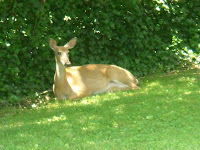 Sometimes the deer has a baby with it. After a while, they will hop the fence into the neighbor’s yard. 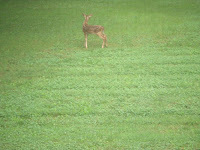 Because its one of those Sundays, a few photos, of a deer in my back yard below the fold. You can see the baby in the 2nd picture. To respond to Patrick (and then I promise this will be the last I’ll say on this until late August…), I largely agree with important parts of what he says, but as a friend pointed out to me, to be able to occupy the position required to realize such a vocation requires a certain degree of luck and privilege. Moreover, I think it is perhaps time to apply some of Patrick’s own ontological commitments to the notion of a vocation itself. As Patrick points out, the idea of a vocation, a calling, is explicitly religious. But our understanding (and his) of that concept is filtered through Christianity, and perhaps here is where some distance from that religion is helpful. In the classic sense, the vocation was a calling to serve one’s religion, and in the Medieval context, the only institutional form for such service was the Church. And to this day, it largely remains so—the vocational calling to religion in the Christian context has one institutional outlet, the Church (of whatever denomination), which sets the terms of service, traditionally through the clergy (to which Patrick compares scholars, the high-priests of knowledge). Things are different today—this is not the world our students enter. 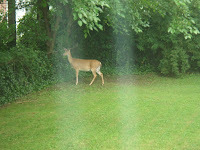 Perhaps lets us think of a vocation not as an essential way of being, but as a set of practices that orient one’s life. Thus, the calling is not to embody a certain essence or acquire certain qualities, but rather to engage in certain practices, certain ways of life. The vocation is not to be a university professor, but rather to engage in the practice of teaching, mentoring, researching, or mastering a certain domain of knowledge. As a friend and colleague said to me yesterday—if I had realized that my vocation was teaching, I would have scrapped IR for a much more lucrative profession and taught technology or something. The vocation to which Patrick aspires exists only in limited institutional forms—the small subset of top 100 (maybe 200 if we are generous) universities in the US (I’ll exclude the rest of the world for now as most of my students aren’t oriented in that direction, and understandings of scholarship and teaching differ enough in other cultural settings to matter for the purposes of this meta-discussion). To get a job in this realm, you usually need to have a Ph.D. from a top 20 school. You must do as Patrick did, not as he does now—a Ph.D. from our institution doesn’t position you all that well to get the type of job that allows one to realize the vocation Patrick describes. Most academic jobs are like that friend of mine just landed—-its tenure track at a small, second tier state school in the middle of nowhere. He’ll be teaching a 4-4 load of large classes to mostly mediocre students not all that interested in Political Science. His department is small, he’ll be one of 2 jack of all trade IR / comparative guys also required to teach a service section of US government every other semester. His research requirements are to stay active in the profession—an article here, a conference paper there, but not the degree of engagement in the profession that Patrick celebrates. Indeed, such engagement in the profession is difficult from such a position given the teaching load and paucity of resources available—resources one requires to attend conferences, conduct research, subscribe to journals and buy books to keep up with the latest research. What worries me most about Patrick’s discussion is the idea that the University is the only institutional form in which his vocation can be realized. Rather, I think one must understand what vocation actually calls them, and then explore the ways of life in which that vocation can be realized. As I was recently telling a student currently at a crossroads in her life, trying to decide upon graduate school or some other path, realize that you can engage in these ways of life in any number of institutional and professional forms. If the calling is to teach, one can teach many places. While the classroom is the traditional place for such exploration, there are many classrooms, and many more teachable moments. Professors teach. But so can high school teachers, coaches, nurses, movie producers, artists, parents, baseball analysts, and many others. If the calling is to mentor, one can mentor in the university, but also in the community center, as a youth group leader, or even in the professional workplace. If the call is to research or to produce knowledge, again, the academy has no monopoly on that. Why must the production of knowledge and research only rest in the academy? I’m reading (slowly—as newborns don’t allow much free reading time) Peter Singer’s Wired for War, and the introduction to the book lays out his biography, his calling to research war. He has all the requisite “scholarly” training (Harvard Ph.D. no less), but he is able to research war from a think tank, and his work has significant impact on how many (including many in the policy relevant community) are thinking about war. Some tenure committee would probably reject the book as not at a university press and not methodologically sophisticated enough, but that’s not the point, and clearly he didn’t write the book for them. He wrote the book because he couldn’t imagine himself writing about anything else. Luckily for him, it also pays well. So, the question is, what exactly is it that you couldn’t not do? What practice must you engage in, what way of life must you lead? These days, I would submit, there are many, many opportunities and institutional forms to realize that vocation, most of which are outside the academy. One can have a love of numbers, charts, research, and public policy, and start a blog about it and turn that into a job. One can love to teach, and find teachable moments in nearly any setting. One can mentor a Big Brother, a co-worker. Why couldn’t Patrick realize his calling working for Baseball Prospectus? They research rigorously, challenge conventional methodological orthodoxy, use innovative technology to teach those lessons to wide ranges of regular and fantasy baseball enthusiasts, and the results of these endeavors have fundamentally changed how many of us understand and pursue the passion that is baseball. One thing I’ve noticed is that the children of academics do quite well in this profession. They want to enter it, they know what it is, and they know what it is they like about it. They understand the “game” and have an intuitive sense of how to play, having grown up steeped in the family business. I grew up steeped in welding equipment and industrial gasses (the Howard family business once upon a time—can you imagine me selling gas?). For quite a while, that led me to a math, science, and chemistry focus, though eventually my love of politics and fascination with the international let me to a shift away from a math-science track to a poli sci / IR track sometime in college. To be able to realize the life of the academic in today’s institutional form requires a significant degree of luck and a significant degree of privilege in addition to a significant degree of skill. Being smart is no longer enough—indeed it was never enough—you must also know the right people, have the right pedigree, and be in the right place at the right time. One must get the right guidance as an undergraduate in order to know which graduate programs to apply to and how to get in—its not something you can do on your own. One must get into the right grad programs with the right advisers to be competitive for a job (and grants and publications and all those other things that help get a job). And, one must have the right topic (and theory and methods) that are ‘hot’ or ‘in vogue’ to impress hiring committees. Privilege can provide a lot of this—access to the right undergraduate situation, ability to engage in the practices that impress admissions and later hiring committees, and most importantly, time to contemplate. Luck also plays a role, as some are simply fortunate to find themselves in the right time. A very bright friend from high school went to Ohio University (not known as a gateway to anything, really) but happened to get along with his history professor quite well and have a strong appreciation of the subject. His history professor was lured away to Yale and brought my friend with him as his graduate student. Indeed, the luck of age is a significant part of this. Patrick and I have discussed where our top students should apply for graduate school to do what we do, to take the next step in realizing the vocation. It’s a tough conversation, as departments have changed and there aren’t a lot of top graduate programs that can train students in our line of inquiry—Patrick’s experience at Columbia is sadly no longer possible, as the particular configuration of faculty, environment, and students have moved on and Columbia is now a different place. What’s missing here is of course the merit part. We like to think of the academy as merit based and merit driven, and on occasion it is. Brilliant people can in fact succeed by being brilliant. But, more and more, merit is merely a necessary but not sufficient condition for success in this field. There will always be room at the top for the best of the best, but none of us are that person (well maybe one of us is—but its not me). There will always be the exceptional student slightly more driven than the rest, able to overcome lack of privilege to succeed –Patrick and I have had such students, and I’m proud of one in particular to say she’s doing quite well as a young scholar and she’s going to make it in this field all on her own. But, the contemporary reality is the institutional forms in which one can realize Patrick’s vocation are disappearing. If you can’t imagine yourself doing anything else, then yes, this profession is for you. Expect significant suffering along the way. Be prepared to accept conditions you otherwise would find untenable to realize your dream. Realize that other portions of your life will suffer to fulfill this one deeply felt need. But for the rest of us, take the time to reflect on the calling you hear toward a vocation. Consider—what is it, exactly, that provides the satisfaction, that fulfills the desire, that provides a way to organize your life. This is in fact more difficult than it seems, and requires some serious personal reflection. It is not a choice to be made lightly. With that in mind, then set yourself free to realize that calling in all the novel and exciting ways that the 21st century provides. Post script— the answer to the obvious is: Yes. But more on that later. I’ll endeavor to return to substantive postings on the actual IR stuff we all enjoy. Breaking news: North Korea has conducted a nuclear test, this one more successful and powerful than its initial test back in 2006. You can read some (very) instant analysis, but the short story is that this move seems puzzling, out of context, which is to say that it doesn’t fit North Korea’s existing pattern of telegraphing its moves and using its nuclear program to extract maximum bargaining concessions from the United States. An initial and early read might be that this test does quite the opposite, confronting a new US administration broadly committed to diplomacy and alienating other could-be allies (Russia, China). 1. This could be driven by domestic politics. From a theoretical point, this is entirely consistent with liberal foreign policy analysis approaches to the study of international politics. However, in areas such as nuclear weapons proliferation and such–the highest of the high politics of security–realism is generally assumed to have an advantage, and states are supposed to put international factors first in making such decisions. That a state would put domestic politics first in matters of such high stakes doesn’t fit our standard explanatory models of state behavior. 2. We have no idea what on earth is going on in North Korea. The DPRK is more than just Another Country, its perhaps the most closed and authoritarian regime in the world today. As Drezner points out, much of the analysis of the DPRK has a hint of Kremlinology to it, and we are right to be skeptical. Information is scarce, and context in which to make sense of that information is even more scarce. That said, even in an authoritarian regime there are politics, and in times of succession, the stakes are high. However, few, if any analysts have a clear picture of who the players are and how the game is played. In that context, a meaningful and effective (from a US foreign policy perspective) response is difficult to construct. This post has been brought to you by the letters O and M and the number 2. There is a massive fight simmering just below the surface here in DC, one that looks to get really ugly, really quick, and with major long-term consequences for national politics. No, its not the pending SCOTUS confirmation fight, but the battle over the Pentagon budget. Secretary of Defense Robert Gates has taken on one of the most powerful and entrenched political forces in Washington, the Defense spending lobby, and as Eisenhower had warned, “In the councils of government, we must guard against the acquisition of unwarranted influence, whether sought or unsought, by the military-industrial complex. The potential for the disastrous rise of misplaced power exists and will persist.” How right he was, and its taken a SecDef as powerful as Gates to launch the fight to bring this to the foreground. The spark for this conflagration was Gates “reform budget” that reallocated defense spending. His proposal to cut or cap certain weapons systems while promoting others has rankled the Services, and their ideas of how they ought to provide for the common defense. Indeed, the US military is now about to embark on the one war it is most prepared to fight–the war for budget share and major weapons systems. Ten years ago, a fantastic little book described the DoD’s attitude toward the budget process as This War Really Matters, and its the fight that the Services, Contractors, and Congress are best prepared to wage. The issues of the day involve the decision to shift money from legacy weapons systems designed to fight a “peer competitor” force (was USSR, now China conveniently fills that role) with weapons better suited for counterinsurgency operations, ie the ongoing wars in Iraq and Afghanistan. I trace part of this struggle to the historical evolution of an overlapping, unclear, and muddled command structure of today’s US Military establishment. In World War II, the fights between Army and Navy were epic, leading to two separate theater commanders in the Pacific (MacArthur and Nimitz) fighting, essentially, two separate wars against Japan. The National Security Act of 1947 unified the services under a civilian secretary, creating DoD. However, the Secretary was initially weak and the Services were strong, leading to several subsequent reforms. The most significant was the Goldwater-Nichols Act, giving us the structure we have today. As a result of Goldwater-Nichols, there are two separate structures of authority in the US military. Operationally, the chain of command passes from the President through the Secretary of Defense, and directly to the Combatant Commander who has complete and total command over all units in his theater (or functional area). However, for procurement, training, and equipping the force, authority passes from the Secretary to the Service Secretary and Chief of Staff of the uniformed service, who determine what the services should buy and how they will use it. Thus, the services sense of identity and mission have a huge role in procurement. Thus, combatant commanders must go to war with the army/navy/air force they have, not the one they would like. Gates seeks to change this, privileging the needs of current combat operations over long-term service identity. Consider the most high profile of these cases in the Air Force. The AF has long seen strategic bombing and air to air combat as its core missions, and has thus pushed for a 5th generation air superiority fighter and new bomber. Gates wants to cut the future bomber and cap the F-22, instead buying more F-35 Joint Strike Fighters and UAV’s. Indeed, some have speculated that the F-22 is the last manned fighter plane of its kind, with the future of air-war employing UAVs in combat roles. Current operations in the CENTCOM theater bear this out. The F-22 has not been used at all in either 6+ year long war, while the demand for UAV’s has skyrocketed, and they have become some of the most significant (if not controversial) weapons platforms in use. But, what is a modern US Air Force without fighter pilots? Now the services and Congress are notorious for thwarting Pentagon budgeting plans. Congress sees the DoD budget as an unchallenged lard-fest, where government subsidies can be thrown to companies in a local district. Contractors facilitate this by actively distributing weapons system production in key Congressional districts, gaining allies for particular programs on the Hill. The Services have long had back-channels to lobby Congress to save particular weapons systems or insert new procurement that the Administration did not request. Gates seeks to end this practice. The stakes are high. Hundreds of billions of dollars are at stake. Contracts, careers, and jobs are on the line. And, somewhere in there, the idea of American National Security almost matters. There will be principled arguments on both sides about the legitimate security needs of the United States. There will be a detailed discussion of the trade-offs between a counter-insurgency focused force vs. a peer competitor force. However, these principled and well reasoned arguments will probably be in the minority. Instead, we’ll see a lot more poorly reasoned arguments (I’ll let Ricks call it dumb) and faux-grandstanding about the rising China threat designed to produce only one logical conclusion: The Army/Air Force/Navy absolutely must must have the FCS/F-22/DDG-1000 to counter the “real” threats of the future. Be wary of such arguments. Beneath all the posturing, beneath the future threats, dire warnings, and beneath the demands of 21st century warfare are good old fashion pork-barrel politics, of who gets what from whom: the most lucrative contracts in all the Federal Budget, supplying major weapons systems to the DoD. If Gates can win this war, it will be as significant to the overall conduct of US National Security policy as operations in Iraq and Afghanistan. After all, This War Really Matters. Stephen Walt asks a very interesting question: why does the US overspend on defense? This is a very smart question, the kind you need to be contrarian theorist to ask. Given the global downturn in the economy, you’d think defense spending would absorb its fair share of pain. As is well documented, the US spends more on its military than the rest of the world combined. And yet, worried that China may be less than 5 years away from sending a sub as far as Guam, there is a well developed narrative and lobby in US politics that we aren’t spending enough. So, defense spending continues to go up and up and up. America’s rise to global primacy was accompanied by the creation of a well-developed set of institutions whose stated purpose was to overcome isolationist sentiments and to promote greater international activism on the part of the United States. American liberal internationalism didn’t just arise spontaneously as America’s relative power grew, it was actively encouraged by groups like the Council on Foreign Relations (founded in 1921), and a whole array of other groups and organizations. By contrast, there are at most a handful of institutions whose core mission is to get the United States to take a slightly smaller role on the world stage…. In short, what I’m suggesting here is that America’s role in the world today is shaped by two imbalances of power, not just one. The first is the gap between U.S. capabilities and everyone else’s, a situation that has some desirable features (especially for us) but one that also encourages the United States to do too much and allows others to do either too little or too many of the wrong things. The second imbalance is between organized interests whose core mission is constantly pushing the U.S. government to do more and in more places, and the far-weaker groups who think we might be better off showing a bit more restraint. In a vacuum, this is an interesting argument, worth exploring. It probably lends itself to some sort of liberal / domestic politics / organizing coalition or constructivist / national identity / lack of isolationist rhetorical commonplaces for legitimation argument, and is an interest case in which to evaluate the two ideas. What it is not, however, is a Realist argument. To continue my picking on Walt, if you’re going to run around calling yourself a realist and writing a realist blog, for cryin’ out loud, advance a realist argument from time to time!!! Lets review: Realism assumes an anarchic world of rational state actors maximizing security, defined as sufficient military force to defend the integrity of a the state. In that anarchic environment, systemic pressures are the primary factor states rationally consider in security decisions. In other words, all states act the same, the only thing that differentiates them is their relative position in world politics, ie their relative power. What Walt claims in his post is that the systemic pressures of anarchy have absolutely no bearing on US defense budgetign and policy. Rather, crazy domestic lobbies have hijacked USFP for some damn fool ideological crusade. This analysis is all well and good, but, and here’s the kicker, Walt’s theory–Realism–says this shouldn’t matter, not one lick! States can have all the internal politics they want, but in the end, systemic pressures shape security policy. The fact that Walt can’t 1) adequately apply his own theory to one of the pressing questions of the day he poses, and 2) has to continually rely on ad-hoc explanations of domestic politics when things don’t go his way, leads me to believe that Walt has abandon Realism for either Rat-Choice Liberalism, or Hard-core, boarder-line PoMo (gasp!) Constructivism. I’m sure he’d reject both labels. If so, Be a frickn’ realist, then Steve!!! Give me a realist explanation for US defense spending over the past 20 years. It should have, as its key explanatory variable, some sort of systemic, balance of power-related force. Inability to do so constitutes a significant failure for realism, and suggests that Walt is fundamentally wrong. Now, there are a lot of sophisticated attempts to add variation to realism, but, so far as I know, they all retain the rational states in anarchy thing, with a lot of (military) power. If this can’t give you any purchase on such an important issue, perhaps its time to re-think the theory. Because, what you said is that Realism can’t explain the budget policies of the signal largest bastion and promoter of Realism, the US Pentagon, then as a theory it needs some work. Sounds like a degenerative research program to me. Now I an see why no one’s a realist any more! Take home point: Only 27% of all higher education faculty jobs are tenure or tenure-tracked positions. The overall number of faculty and instructor slots grew from 1997 to 2007, but nearly two-thirds of that growth was in “contingent” positions — meaning those off of the tenure track. Over all, those jobs increased from two-thirds to nearly three-quarters of instructional positions. The growth in these jobs — and the decline in tenure-track positions — was found in all sectors of higher education, but was most apparent at community colleges. However, one of the most notable shifts was at public four-year colleges and universities, where over the period studied, tenured and tenure-track faculty members went from being a slight majority to less than 40 percent of faculty members. At the end point of the AFT study, tenured and tenure-track faculty members do not make a majority of faculties in any sector. Not to continue my embittered rants, but the jobs you may have been promised going into grad school simply may not exist by the time you finish. Moreover, we as a profession need to reconsider how we treat the vast majority of practicing professionals not in the cushy TT jobs, and appreciate more ‘non-traditional’ career paths. To marginalize someone because they spend time slumming with the rest of the non-tenure track crowd does a disservice to your future student will will end up there through no fault of their own.